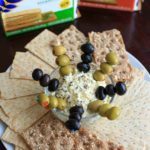 Olive goat cheese dip is a quick and simple appetizer that can be prepared ahead or on the spot. Sure to be a crowd pleaser! Then this dip is for you. Luckily (but also dangerously) I love both olives and goat cheese. The last time I stopped in to get a snack at a hot bar, I couldn’t decide what I wanted so I just bought $8 worth of olives. True story. So yeah, I like olives. 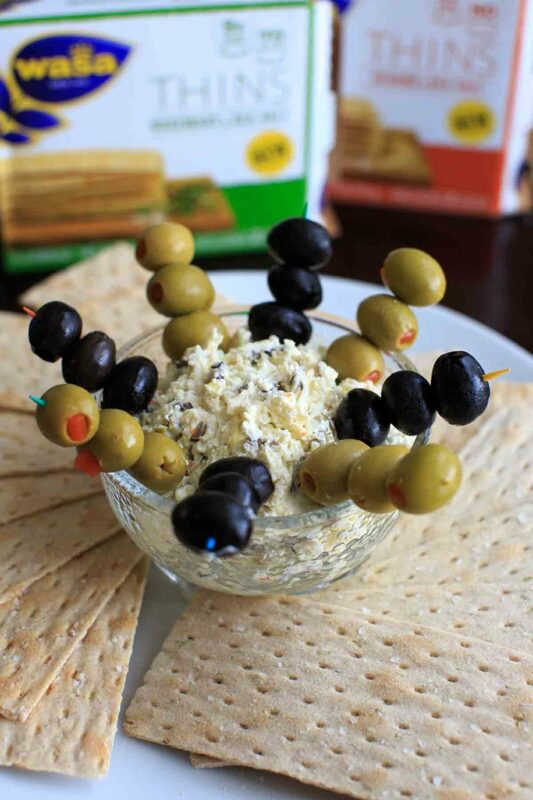 While making this dip, I may have also popped an olive or two in my mouth every time I chopped one up or put another on a toothpick. For every olive you see pictured I probably ate two more. I’m a little obsessed with this dip. I used black olives AND pimento-stuffed olives. Feta cheese + a little cream cheese. Olive oil for consistency, and voila. It’s super easy to whip up. I added just a teensy bit of onion powder for flavor, and I definitely don’t think it needs any more salt between the saltiness of olives and feta. But no judgment if you want to add some. With this recipe I was able to try out the new Wasa Thins Rosemary & Sea Salt and Wasa Thins Sesame & Sea Salt. 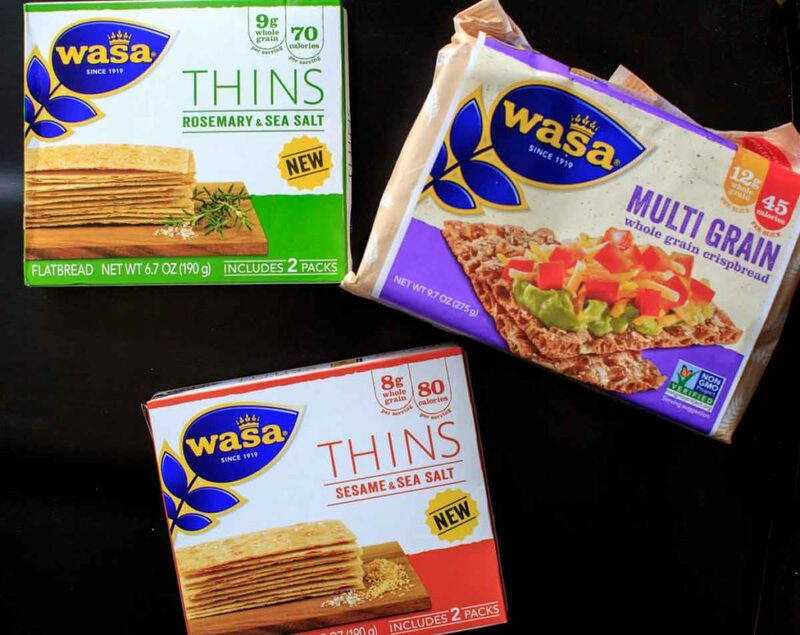 I also picked up Wasa Multi Grain crackers because they were thicker, and at first I wasn’t sure if the Thins would hold up for this dip. But they are surprisingly sturdy! Both varities of the Thins are oven baked with a delicate crunch and have 9 grams (for the rosemary) and 7 grams (for the sesame) of whole grains per serving. The multi-grain is much thicker and extra crunch and is a blend of rye + wheat + oats + barley, with 12 grams of whole grains per serving. The best part? All have no preservatives and are Non-GMO Project Verified. 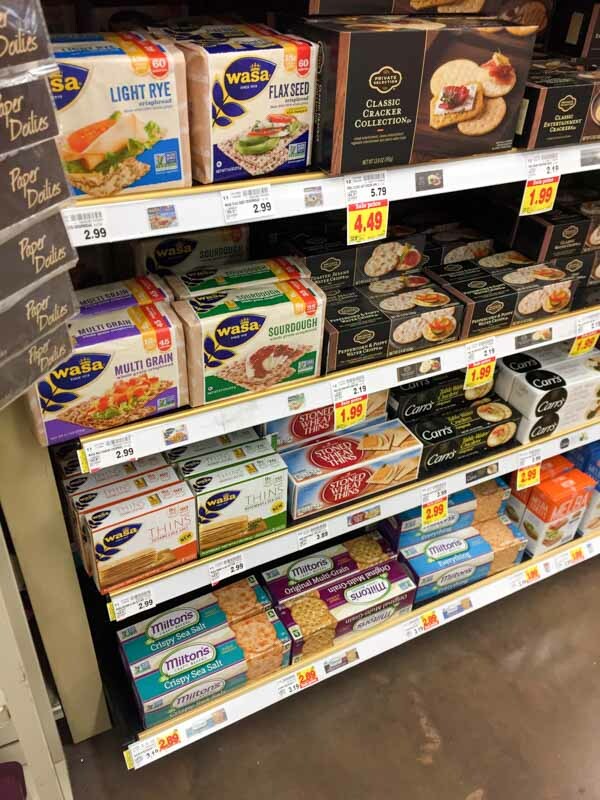 You can find the new Wasa Thins at select Kroger’s on the cracker aisle. Be sure to check the product locator on the Wasa website to see if your store has them! 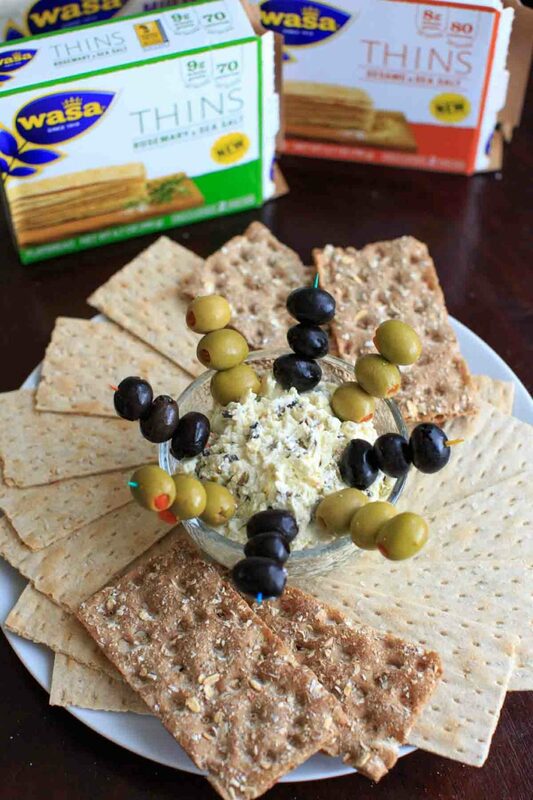 Find more recipe inspiration for Wasa crackers at this link! 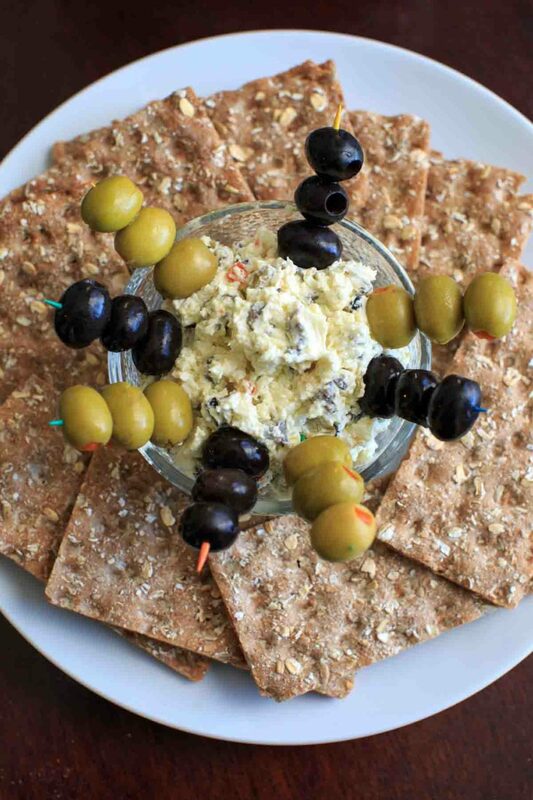 Mix together cream cheese, feta cheese, and chopped olives in a bowl. Add olive oil and onion powder and stir to combine. 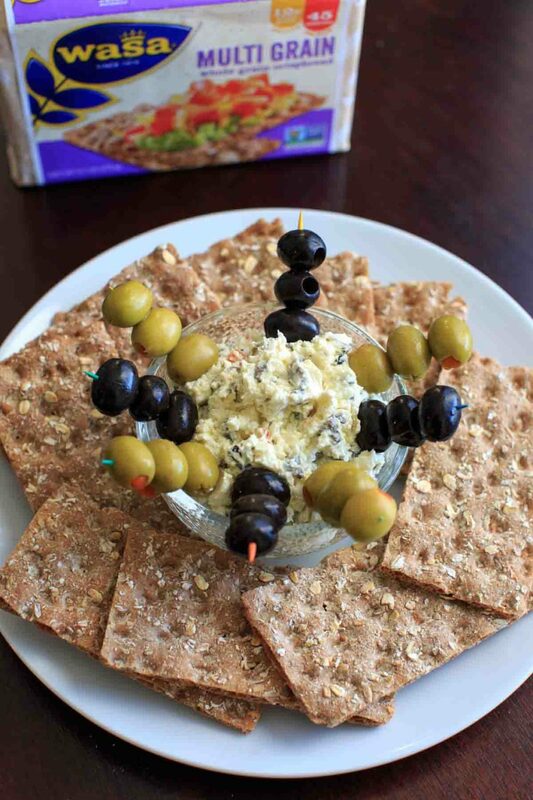 Dip with assorted crackers. How did you discover that you liked to eat goat cheese? 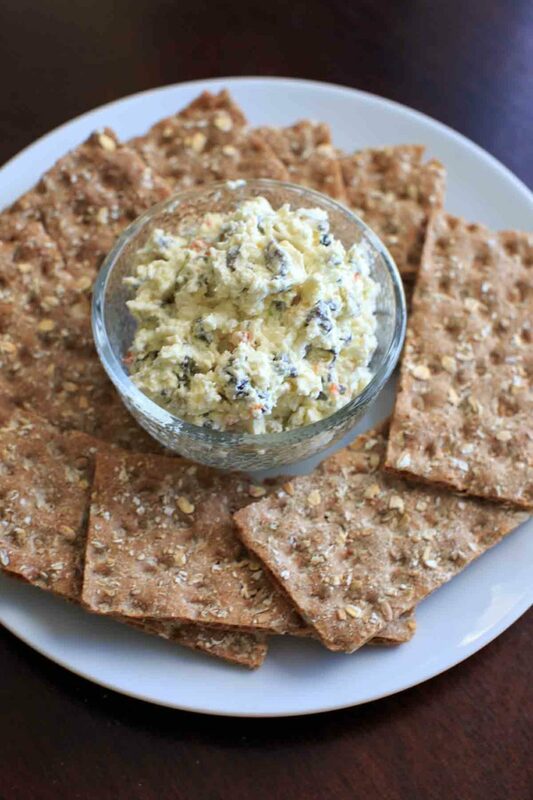 And where is the goat cheese in this goat cheese dip?